Have you met our mascot Oliver? 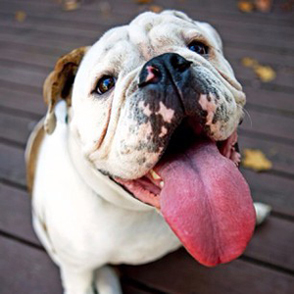 Oliver is our lovable English Bulldog who loves to hang out and brainstorm with the Think Tank Ninjas. Affable, funny and always entertaining, Oliver is easy to love and a real spectacle around Ninja Central. He’s always off on some sort of marketing adventure with the Head Ninja. Oliver is a local celebrity, often being asked to attend press junkets and more for local charities and has a pretty big following of his own on Facebook. Life is certainly never dull when Oliver is around!